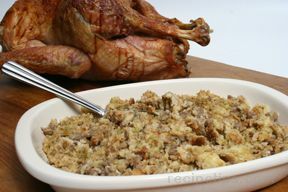 For the occasions when you need just enough stuffing for the immediate family, this easy recipe is for you. 1. Preheat oven to 350°F. Melt butter in large skillet on medium heat. Add celery and onion; cook and stir 5 minutes. Stir in stuffing mix. Add chicken broth and poultry seasoning; toss gently. Spoon into lightly greased 2-quart baking dish. 2. Bake 30 minutes or until heated through and lightly browned.